As I mentioned at the end of July’s update, we actually started August in Germany, Bavaria to be precise, in a little town called Tegernsee to be even more precise. We were visiting for a friend’s wedding and what a day and place for a wedding it was! We had bright sunshine, blue skies and mountains surrounding us, while Ben & Melli tied the knot and we all ate, drank and celebrated with them into the night. The ceremony was lovely (even more so when we got the translated down-low!) and the food was delicious. I was also in awe of everyone in their traditional Bavarian dresses and Lederhosen too - everyone looked AMAZING! 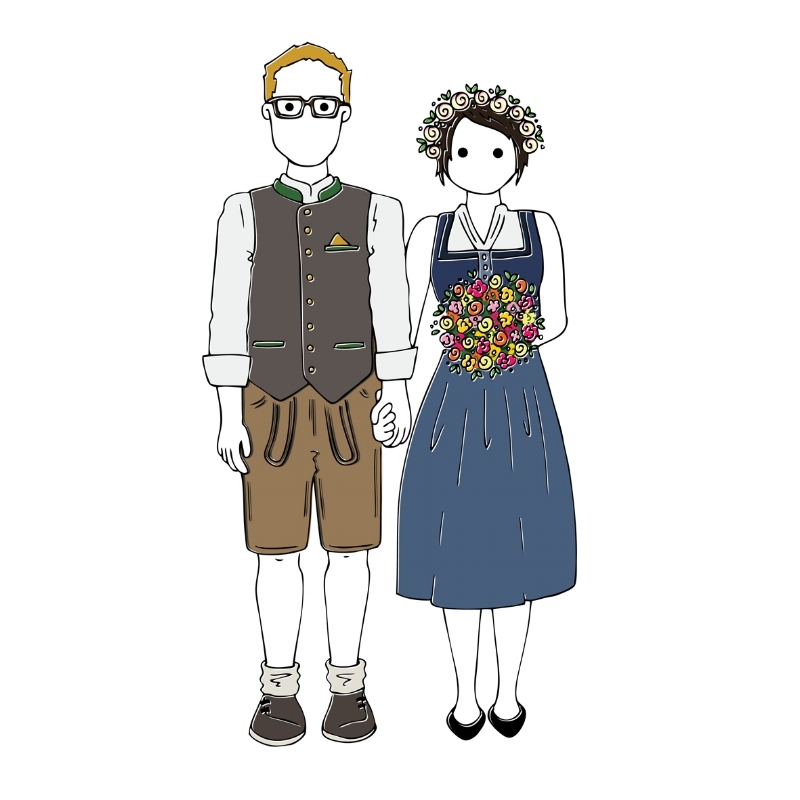 Obviously had to create a Sunshine Portrait of the happy couple in their traditional Bavarian attire! We decided to make a mini-break of our trip over to Germany, so planned to stay for a few days after the wedding itself and boy am I glad we did - Bavaria totally stole my heart! We were treated to stunning scenery everywhere we went, from mountains and lakes to beautiful yellow buildings and picture-perfect, lakeside cabins. We felt right at home in our little AirBnb, which was just a short walk from the lake in a place called Gmund. We were a quick and an easy drive from numerous mountains and other lakes so we were spoilt for choice with hikes, paddle boarding, swimming and bike hire places, all on our doorstep! Without really knowing what to expect when we arrived, (we did little to no pre-planning or research beforehand!) we ended up having the perfect mini break. Both of us are outdoor lovers (as you may have gathered) and Tegernsee really does offer it all and then some. We enjoyed morning and evening swims, we trekked around Schliersee and paddle boarded at Bad Wiessee, rode the cable car up Marky Mark Wallberg and hiked up to the Tegernseer Hütte at Roßstein and Buchstein. I literally could not get enough of the beautiful scenery, as far as I was concerned, we were in such a perfect place for us! …even if we only went back to sample more of the delicious food and beer! I know it seems like I never work, and let’s be honest, this year has mostly been about adventures, what with the wedding and everything else we had planned, so you’d be right in thinking I haven’t been working as hard as I normally would. However, I can assure you, when I have been at work I have been throwing myself into it (with my furry helpers!) and really enjoying being back in the studio. From wholesale orders, commissions and custom kitty pins to pop up events and working on new festive designs, I’ve been having a great time! OK, so I may have had a wobble about my portraits (see my previous blog post) but overall I’ve loved being back at work and … dare I say it… getting in the mood for CHRISTMAS! Being a home girl at heart (Nottingham forever!) I was super chuffed to see a drawing of the council house I did for Handmade Nottingham being used on some brand new totes too. The perfect place to keep your Little Left Lion pin too, right? Grab your very own Council House tote bag from Handmade Nottingham and we’ll see you at the Lions, yeah? Left Lion pin also available at Handmade Nottingham! YAY! From Nottingham to Cambridge, I also had a really lovely day out with the Cambridge Made team at the Botanical Gardens. It was so much fun to wander about, perv at plants and meet up with lots of new (and familiar) faces too! Another local treat this month, was working with Catrina and Nelson who own La Latina Bustaurant. If you haven’t been already to sample their authentic (and incredibly tasty) South American & Latin cuisine then you are missing out! Not only can you indulge in some amazing foodie treats on their pimped up bus, you can now enjoy a spot of colouring in too. I had the absolute pleasure of creating these super fun colouring pages for them and both times I’ve been in to say hello (and stuff my face) my little heart has almost popped with excitement at seeing people colouring in and designing their own buses! I couldn’t resist creating a full colour version of the Bus for them too, I mean LOOK at how colourful and incredible the paint job is - so much fun! That’s enough of work for now though, let’s get back to adventures, better still, mini adventures with the new love in our life; Buddy the Sunshine Van! Apart from camping in the garden and the odd trip to the supermarket, we finally got to take Buddy on our first official trip and it was GREAT! We didn’t go far but went somewhere new and headed to the Suffolk coast to enjoy some sea air, mini rambles and an overnight stay in the woods. On the Saturday we popped in to Pump Street Bakery for a cheeky doughnut (after failing to book a ferry in advance to Orford Ness), we enjoyed a walk along the seafront at Aldeburgh, we treated ourselves to fish ’n’ chips and we parked up Buddy and listened to the whistling kettle as we made tea. Can’t beat the sound of a happily whistling kettle! After a night listening to screaming barn owls (scary sounding buggers! ), it was quite magical waking up in Buddy on Sunday, surrounded by trees and morning birdsong. And after a couple of brews and a bacon butty, the terrors heard during the night were soon forgotten, shame we didn’t actually see any Barn Owls though, they’re so beautiful to look at! When I was little my Grandparents used to take us to Attenborough Nature Reserve (in their camper!) to feed the ducks and walk around the water. It’s a lovely spot and one I enjoyed visiting throughout my childhood and well into my ‘grown up’ years so it felt only right to take Buddy when we got the chance. After parking Buddy and setting up his awning with a table for making brews, I felt quite emotional being back. We invited friends and family to join us (rather than driving around a million houses on our short trip back to Nottingham) and despite the weather being less than perfect - it p*ssed it down - so many wonderful beans turned up to meet Buddy and say hello! How many people can you fit under Buddy’s awning? Similarly to July, I ended August by trotting off on more adventures (eep!) as Claireabellemakes and I headed up to Glasgow for the In Colourful Company walk, hosted by Nikki (Nikki McWilliams), Kim (Finest Imaginery) and Rachel (Onrshop). It was all a bit last minute but we were mighty excited. However, as the walk didn’t actually take place until 1st September, I’m going to save my Glasgow update for next time… it’s going to be a colourful one so make sure you check back if you’re curious about what we got up to (and ate!) while we were visiting Scotland! Thank you, (as always) for reading and until next time, here’s wishing you all a wonderful September… and October while we’re at it because I’m likely to be late with my next monthly update!